Villa Marie Claire is a specialty medical program of Holy Name Medical Center, located in Teaneck, NJ. The Holy Name Medical Center Foundation is a 501(c)(3) non profit organization who's mission is to encourage the philanthropic support of all Holy Name Medical Center initiatives, including Villa Marie Claire. The Villa relies on contributions to deliver its unique and compassionate care at the end-of-life. There are many ways you can support Villa Marie Claire and help to ensure that we provide essential services to others in our community. Your gift to Villa Marie Claire supports care for those at the end of life and their loved ones. Making a gift today will make an immediate impact in our efforts to increase access to hospice care and can be a meaningful way to remember a loved one. Honoring someone by making a memorial gift to the Villa is a wonderful way to remember a loved one. An acknowledgement will be sent to the person you wish to be notified of your gift without reference to amount. You can contact the Holy Name Medical Center Foundation at 201-833-3187 to make a donation over the phone using a credit card. Or make a secure online donation with a credit card today. Online giving is a convenient and effective way to support the Villa. Make a secure online donation with a credit card today. A transfer of securities — particularly those with appreciated value — helps the Villa while offering the potential of tax savings for the donor. Call the Holy Name Medical Center Foundation at 201-833-3187 to learn more or to arrange such a gift. Consider a bequest in your estate planning. Ensure that the Villa's work continues into the future by designating a gift to Villa Marie Claire in your will. To learn more, contact the Holy Name Medical Center Foundation at 201-833-3187. We actively seek major charitable gifts to ensure that Villa Marie Claire's unique vision and stellar care continues to serve members in our community. Your investment and commitment to the Villa will enrich the lives of every patient and loved one who experiences the care and compassion that the Villa has to offer. There are various naming opportunities available for major benefactors. When creating an online memorial, social media post, or obituary, you can direct friends and family to make a gift in your loved one's name by sharing the website of the organization, such as the Villa Marie Claire site, you wish to benefit. Wait at least 24-48 hours before making an announcement on your social media channels, which will give you time to notify close relatives and family over the phone or in person. While social media can provide another way to grieve and memorialize your loved one, it is important to share the news in a more personal way first. 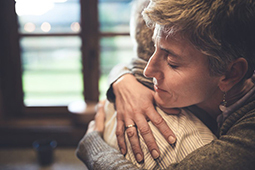 It can be difficult to express grief during a time of loss — whether sudden or expected. There is no right or wrong way to say how you feel. Share positive memories you experienced together and direct people to an online tribute or memorial, if one exists. Your gift helps to ensure Villa Marie Claire's vision continues to benefit and enrich the lives of every patient and family who experience the compassionate care and celebration of life that is unique to our mission. Copyright © 2019 Villa Marie Claire, All rights reserved.